Join Mana Jampa, Jane Bell and famed Egyptologist Emil Shaker for this high-frequency spiritual pilgrimage to the Holy Land of Egypt. Delve deeply into the eternal realms of the Mystery Schools. Experience daily ceremony, meditation, healing and yoga on this physical and metaphysical journey. This unique journey features extensive private time in numerous sacred sites, a luxurious private cruise on the River Nile and 5-Star accommodations throughout. We are also blessed to share sacred ceremonial initiations in the full spectrum of all three Pyramids of the Giza Plateau. Be prepared for Divine surprises and magic. Depart for Cairo from your home. (To be ready for the pace you can always choose to come a day or two early). Arrive in Cairo and check in to the exquisite Mena House Hotel across from the Pyramids. We will circle and attune to the energies of the Giza Plateau and then enjoy our welcome dinner together. 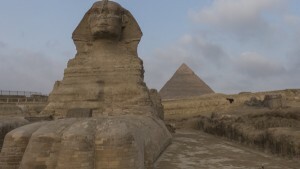 At dawn we will process up to the Giza Plateau for our private ceremony within the Paws of the Sphinx. Then we will explore the Giza Plateau sharing meditation and initiation, experiencing the sacred energies of the three large Pyramids. We return for breakfast and then meet later in the afternoon to deepen our exploration of the journey. After breakfast we depart Mena House and visit the ancient healing complex of Sakarra; including the recently opened Serapeum which is filled with amazing passageways and 24 granite sarcophagi weighing 70 tons each. Later we share lunch on the Sakarra road and head to the airport for our flight to Aswan. Upon arrival we will board the Afandina for nine nights upon the Nile. Dinner is on board the Afandina as well as all meals along the Nile. This morning we drive into the Sahara Desert to Abu Simbel. Hewn of a mountain for Ramesses II, this magnificent temple complex is both an ancient and modern engineering marvel. We will enjoy sunrise within these twin temples of Ramses II and his beloved Queen Nefertari. We spend the night at Seti Abu Simbel hotel and enjoy our dinner and evening in this peaceful and holy atmosphere. After breakfast we enjoy an early morning drive back to the Afandina for lunch and an afternoon Felucca ride upon the Nile. Here we will share a ceremony of blessing for the Nile, the backbone of Osiris to the ancient Egyptians. Stargate day. In the early hours of the morning we begin our pilgrimage to the Temple of Isis for a pre-dawn ceremony in the holy of holies. Afterwards we will celebrate the sunrise on the Nile as we purify ourselves at the banks of the Nile. We return to the Afandina for breakfast and then sail to Kom Ombo, the temple dedicated to two gods, Sobek, the crocodile god and Horus, the falcon. We dock that night on a small island. Enjoy a magical day of sailing the Nile, having time to integrate and circle. Arrive in Edfu for our private evening visit of the Temple of Horus under the stars. A beautiful day cruising the Nile to integrate, practice, circle, and enjoy the magnificent scenery. We dock in Esna to go through the locks. fter a beautiful morning sail we arrive mid-day to the powerful city of Luxor, home to the monuments of the New Kingdom and its glory. We will visit in the afternoon the 3,600 year old Karnak Temple complex and have an initiation with the goddess Sekhmet. That evening we will visit the Temple of Luxor. Both Karnak and Luxor Temple dedicated to the gods Mut and Amon were connected by 2 miles of Avenues of Sphinxes. Some of that grandeur is being restored today. A wonderful early morning bus ride to the ancient pilgrimage site of Abydos, where for centuries kings and commoners have journeyed to pay respect and ask for blessings from Osiris. According to legend, the head of Osiris is buried here. This temple contains the most beautiful reliefs in all of Egypt as well as some of the most prophetic carvings on Earth. We continue on just behind the main temple to one of the premier power places on the planet: the mystical Osirion, ‘Tomb of Osiris’. Some Egyptologists and scholars say that the Osirion is over 40,000 years old. We will work with the Flower of Life sacred geometry symbols here. Later we drive to Dendara Temple dedicated to Hathor, where we will meet and work with the goddess of love and joy. For thousands of years the statues of Hathor and Horus were escorted from their respective temples in barges and ceremoniously reunited upon the Nile in celebration of the union of divine masculine and feminine. Morning flight to Cairo and return to the Mena House. Afternoon circle in preparation for our private meditation and initiation within the King’s Chamber of the Great Pyramid. After breakfast we visit the Egyptian Museum which houses the treasures from all the temples we have seen upon our journey. Afterward we visit the amazing Khan Il Khalili bazaar, the souk made famous by the Nobel Laureate writer Nagib Mafouz. That night we share our closing dinner celebration and feast. Gratitude prayer circle and hug fest, international departures bringing Heavenly blessings wherever you shall go. Please note that this itinerary is tentative and open to changes as necessary to create the best journey possible for all involved. Expect the unexpected, be flexible, spontaneous, and enjoy! Before making a deposit, we request that you have a conversation with Jane or Mana to make sure that this is the perfect journey for you. Space is limited. Sign up to let us know of your interest and be one of the first to hear about our next trip. Click on image to view photo galleries from a previous Egypt journey.